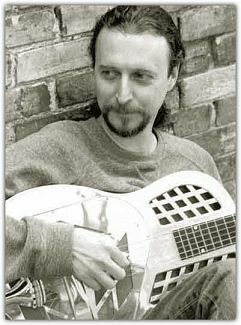 Jerry Kosak is a guitarist and composer performing original music for solo guitar. Drawing from a diversity of musical experiences, his compositions and playing style blend contrasting idioms to create a fresh image of traditional music. Blues, classical, rock, and jazz have all been influential in producing a musical approach with a “great reflection of many different styles,” according to Kevin Barnes of KBEM radio. While Jerry’s music hearkens back to traditional roots, his career path has been anything but traditional. Jerry grew up in Pittsburgh, PA and didn’t touch the guitar until age 19, when the lure of the electric guitar became too powerful to resist. Steve Howe, from the band Yes, was a major influence on Jerry’s early development and inspired him to explore a wide variety of musical styles. Motivated by Steve Howe’s Mood for a Day, Jerry soon added classical guitar to his repertoire, and after only six months of lessons, he auditioned for - and was accepted into - the guitar program at Arizona State University (ASU) where he studied with Frank Koonce. In the fall of 1980, Jerry formed Chosen, a Christian-oriented, progressive rock band. To learn more about Chosen, click here. Upon graduation with a degree in Classical Guitar Performance from ASU in 1982, Jerry devoted his energy to performing with Chosen. The band recorded a self-titled album in 1982 and continued to perform for another year before finally disbanding in 1983.